Solar panel construction has been undergoing some major technological innovations recently. The Independent reports researchers have found that the application of magnesium chloride, which is derived from edible salt, may revolutionize the production of solar panels. Not only can magnesium chloride make the panels more flexible and user friendly, it is also significantly cheaper than traditional (and toxic) cadmium chloride. Another promising material, the mineral perovskite, is able to enhance the efficiency of conventional solar cells made of crystalline silicon. According to CNN, perovskite can simply be put on top of silicon solar cells to make them more efficient. Furthermore, a team of researchers at Michigan State University has developed a completely transparent, luminescent solar concentrator. These transparent solar cells could be used on tall buildings with many windows or even mobile devices. The solar panel construction industry is likely to flourish in the next decade thanks to innovations like these. While solar panels might replace entire electrical grids in the future, let’s look at how and where they are used today. The U.S. Department of Energy states that solar panels are ideal for creating outdoor lighting for sidewalks, lawns and gardens. Additionally, homes with hot tubs or swimming pools are capable of using solar heating systems, which are cost-competitive due to low operating costs. Solar panels used to power residential and commercial buildings are typically mounted on rooftops (or sometimes on the side of the building) as modules that appear similar to roofing shingles. Furthermore, they are also used for emergency phone systems, road signs, speed cameras, and satellites. Solar panels are actually comprised of photovoltaic cells and work by letting photons – light particles – knock electrons loose, allowing them to flow freely and thus generating a flow of electricity. Photovoltaic (photo meaning “light” and voltaic meaning “electricity”) cells are made of two slices of semiconducting material like crystalline silicon. The PV cell establishes an electric field by giving each slice a positive and a negative electrical charge, respectively. This is done by making the top layer phosphorous (which adds extra electrons, resulting in a negative charge) and the bottom layer boron (which means fewer electrons and thus a positive charge). Now, when a photon knocks an electron free, the electric field will push it out of the silicon junction. Metal conductive plates on the sides of the cell collect the electrons and transfer them to wires where they flow like any other kind of electricity. Scientists and researchers, such as physicists and chemists, are unsurprisingly at the forefront of the latest technological developments in this industry. However, in order to put this research into motion, solar technicians are needed for installing, maintaining and repairing these systems. According to the U.S. Bureau of Labor Statistics 1, the main duties of a solar panel installer involve preparing the installation site, including auditing the structure for existing electrical systems and possible safety measures. In many cases, buildings have to be upgraded to support solar panels, which can involve reinforcing the roof, replacing rafters or installing supports. Additionally, the roof must be prepared to attach the mounting systems. Solar panels must be handled with great care, as they are fragile, heavy and expensive. The profession of the solar panel installer is complex and comes with a lot of responsibilities. Hence, these professionals need comprehensive solar panel installation training and practice. Vocational programs can also train students in the latest technological developments in solar panel construction, so they will be well-equipped for this quickly evolving market. Many technicians are licensed or certified. 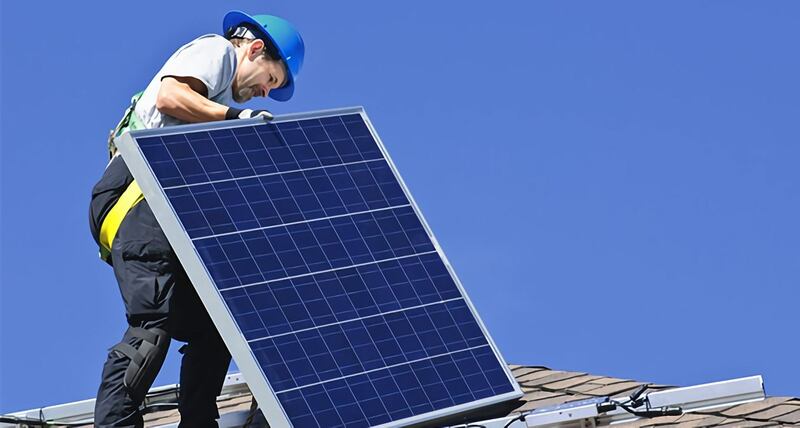 Completed formal training and credentials typically increase a solar panels installer’s chance of employment, especially in light of the ongoing technological advances. Given the growing interest in solar power technology, the demand for solar technicians is on the rise. States with the greatest need for solar techs will be California and Arizona, based on the projected growth in the industry in these states. The technological progress made in solar panel construction has allowed solar energy to become a viable alternative to other power sources. For example, The Energy Collective mentions that the costs of installing, maintaining and servicing solar panels for power usage has seen a dramatic drop. From 1977 to 2013, the costs associated with solar energy have decreased by 99 percent. Furthermore, the prices continue to drop, as noted by the U.S. Department of Energy National Renewable Energy Lab in a news release for October 2014, reporting an additional 12 to 19 percent drop in solar panel costs nationwide. As a result, the use of alternative energy sources including solar are purported to produce 15 percent of electricity throughout the U.S. by 2020, followed by 27 percent in 2030 and 50 percent by 2050. Due to the considerable nationwide investment in solar energy research and technology, those interested in finding employment in this field may have promising prospects. Solar panel construction is on the cusp of becoming a mainstream supply of power production, thanks to the progresses in solar technology rendering solar energy more efficient – both cost- and user-wise.